Since that time the Skyteam member has moved to Heathrow. Most importantly it has taken delivery of the first three of 16 Boeing 787s on order, the new Dash Nine model, larger and with more range than the initial aircraft. What the Dreamliner offers is not only much larger windows, but a cabin pressure as near to normal as possible, while seemingly no quieter than its contemporaries. It is certainly a less tiring aircraft to fly in. London to Hanoi and back, with just an overnight stop, was accomplished without any real effect of tiredness. In what many would consider an act of political expediency the airline has also ordered the Airbus A350 XWB and somewhat more quietly taken delivery of just one aircraft with another 12 to come. The Boeing has a slightly longer range but a smaller carrying capacity. It is still the only carrier from Heathrow into a market that is expanding at a pace with a lot more to come. Vietnam is a tourist paradise. BTN reported two years ago. We will be updating on Hanoi shortly. Vietnam Airlines uses Terminal 4 at Heathrow, many people’s favourite. It is not busy, and has been the subject of a fine makeover by Heathrow Airport Ltd (HAL). Drop-off for private vehicles is the platform opposite the departures/arrivals building. BTN tends to use the APH Park and Ride valet service which is quick, reliable and good value. APH (Purple Parking is the contractor) is on level 2 of the multi-storey car park and is under cover and dry. The Skyteam lounge covers two floors and has all the facilities required including a Spa. Delta clients, who also use the Virgin Clubhouse in T3, will however notice a difference. Do not expect the same standard of catering. The airline’s main marketing focus is Vietnam itself, a Communist state very friendly towards American and most welcoming to British travellers. 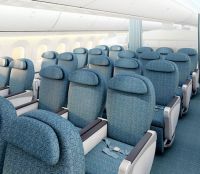 Vietnam Airlines flies to more than 40 destinations in Asia, including China, Japan and Taiwan as well as emerging destinations such as Cambodia, Myanmar and Laos, an unrivalled network in Indochina and Southeast Asia. English is compulsory at schools and is the second language although not that widely spoken. In Hanoi most good restaurants, museums and forward-looking entertainment centres offer an English explanation. Flying outbound BTN was booked Premium Economy. 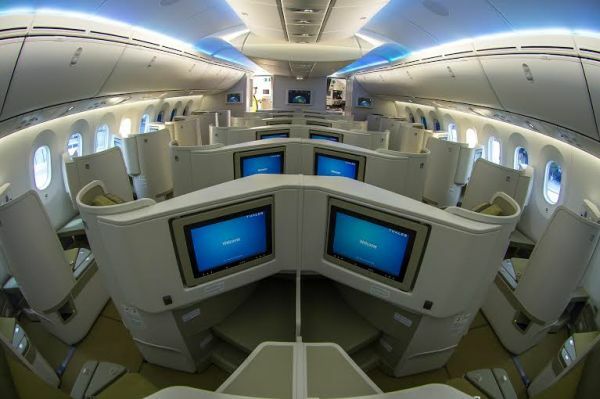 What you get is what the package says – an upgraded Economy in terms of seating and service but Economy catering. On offer are 35 seats in 2+3+2 formation, with a 42-inch seat pitch and 7 inch recline. All Premium Economy and Economy seats also feature individual 10.6-inch in-seat TVs with HD touch screens. A firm table is provided but storage space is limited to under the seat in front. Wi-fi is provided for but not yet operational and there is a multi-function electrical supply, fine for UK plugs. The IFE package is limited with just 100 films, many only for domestic consumption. We were told that the contract is being renegotiated. Where the service falls short is in terms of food supply which is the same as Economy, very limited and no vegetarian option. There are sandwiches available but again they were packaged with a meat option. Soft drinks before take-food, an useful amenity bag and slippers were available. Once airborne a full bar service was provided and a choice of red or white wine for dinner. Called supper the meal was served quickly and two hours before landing a hot breakfast was offered. Fresh fruit, yoghurt and a choice of a scrambled egg dish or steamed rice and chicken. The meal was reminiscent of charter flights from the last century. The return was in Business Class with a really clever seat arrangement allowing every passenger access to the aisle, the fully flat units angled towards the lovely large windows, and offering plenty of storage space including a water receptacle. True it was a late night flight with a 01:30 take-off but the hot food on offer was really limited and again no vegetarian, clients needing to pre-book. Fortunately BTN had dined very well with Mr Lai Quoc Cuong of Vietcharm Tours, who had made all the excellent landside arrangements for what was just a 48-hour stopover. A dreary looking heated breakfast was served. Had BTN been in Business Class outbound the menu read far better with some interesting cocktails available, including Hello Vietnam, Red River and Saigon Sunlight. Jackets stored away by the friendly cabin crew and Champagne offered. A selection of starters included marinated crayfish, prawn saffron, smoked tuna and potato salad or Bresaola beef with vegetable salad. A fresh vegetable salad was provided followed by Jerusalem artichoke soup. The main course selection included grilled corn-fed chicken in Somerset cider sauce, potatoes with herb; pan-seared cod in tomato butter sauce, cocotte potatoes with parsley; braised beef short rib steak, jasmine rice; and stir-fried prawns with ginger and onion sauce, rice boodle. The desserts offered cheese, fresh fruits, miniature pastries and ice cream. But no Port to top it off.